Malahide Road, Swords, Co. Dublin. The largest Shopping Mall In North County Dublin Has 2000 Car Parking Spaces And Over 100 Shops. Open 7 Days A Week. Telephone Number 018904580. Fax 018904586. By the way, a pavilion is a ''Large Tent'' used for outdoor parties and marquees. The centre was completed and officially opened in 2001. It stands on 16 acres. The Superquinn store has changed names and is now owned by Super Value. The rebranding of Superquinn takes place on the 9th of February 2014. From this date the shop will be known as Super Value. All the products will carry the Super Value label. The store name also changes. Some of the best loved Superquinn foods will be kept including their famous sausages but will be re-named Super Value. of Art and crafts in Pavilions. newspapers. Also sells art supplies. Book sellers, located on the ground floor. 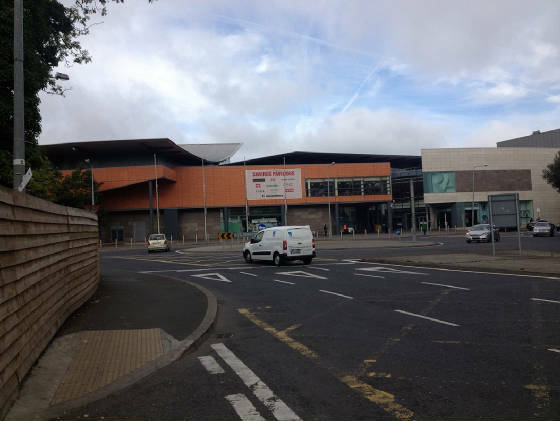 This shopping centre first opened in 2001 to cater for the huge influx of people to the town of Swords. New housing estates were springing up like their was no tomorrow. Before The Pavilions came the native population travelled to Dublin City for their clothes shopping as there was little or no drapery shops in the town. The centre has been extended with phase 2 including the Post Office and a new anchor tenant, Penneys. This part of the centre is names ''Swords Central'' . Another phase was supposed to have taken place named ''Phase 3'' but with the recession kicking in during 2008 this phase was cancelled. It was to have included the British food and clothes store Marks And Spencer. Subway ground floor Swords Central beside Post Office, new shop no telephone number. Starbucks 8903997 Ground floor beside main entrance.